Studies in Natural Products Chemistry, Volume 10: Stereoselective Synthesis (Part F) is a collection of articles about studies on important organic molecules. 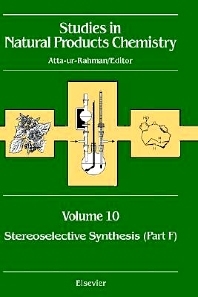 The book covers studies such as that on the synthesis of cembranes as well as its natural occurrence and bioactivity; the stereoselective synthesis of Vitamin D; the synthesis of isoquinolinequinone antibiotics; and the nucleophilic addition chemistry of polyunsaturated carbonyl compounds. Also covered in the book are subjects such as developments in the synthesis of medium ring ethers; the biological properties, chemistry, and synthesis of didemnins; and natural products synthesis based on novel ring transformation. The text is recommended for organic chemists who would like to know more about the progresses in the study of important organic molecules and their implications in different fields.